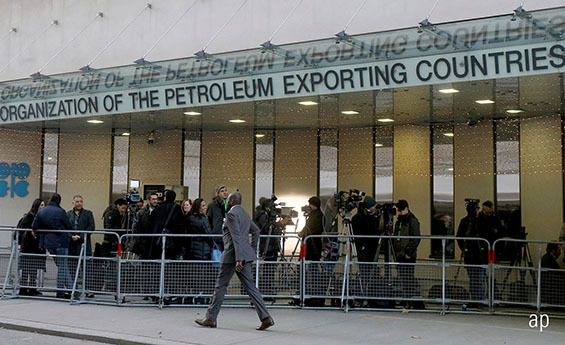 OPEC’s meeting in Vienna today will be scrutinised more closely than usual amid a backdrop of plunging oil prices and political changes within the oil producing countries. After a period of firming crude oil, prices have plunged from $86 a barrel of WTI crude to $60, making a production cut of around 1 million barrels of oil a day all but inevitable. Plunging crude prices have been another factor in the stock market’s wider volatility, with weakening energy stocks weighing on global indices such as the Dow Jones. The US-China trade war is also expected to drag on global demand for oil, although the recently announced 90-day truce should provide some drag on that effect. The 15 OPEC countries will be joined by the so-called “Opec-Plus”, which includes Russia. President Vladimir Putin shrugged off the diplomatic firestorm surrounding Saudi Arabia’s Mohammad Bin Salman by greeting him enthusiastically at the recent G20 Summit. “Saudi Arabia and Russia have already pledged their commitment to oil cooperation and a willingness to curb production in 2019, and we expect OPEC+ to bring the market back into a better balance when they meet on Thursday” said Candice Bangsund, vice president and portfolio manager at Canada’s Fiera Capital. OPEC is usually seen as a cohesive organisation but news that Qatar will withdraw from the cartel next month has rocked this consensus. Ostensibly, Qatar’s withdrawal is due to plans to focus more on natural gas output. But a diplomatic rift with the world’s largest oil producer, Saudi Arabia, has also been a driving factor. Bangsund notes that while Qatar’s decision to leave has had negligible impact on crude prices due to the small percentage of OPEC production, the risk remains that walking away from OPEC controls could see Qatar increase output and undermine OPEC+ efforts to support the market. Qatar pumped 610,000 barrels a day in October, less than 2% of the group total of 33.3 million barrels per day. However, more that production numbers, it’s the political risk that worries some portfolio managers. “OPEC isn’t what it used to be, and the politics behind the organisation is starting to show”, said Greg Taylor, portfolio manager at Purpose Investments. Could other countries follow Qatar’s lead and leave the cartel? Shares in the FTSE 100’s big oil giants Royal Dutch Shell (RDSB) and BP (BP.) have suffered since the crude oil price went abruptly into reverse. Shell’s shares hit £28 in early summer but are now down to £23. Having approached 600p a share after a recent strong run of results, BP’s shares have retreated to 500p. Morningstar analysts rate both stocks as four star, which means they are undervalued. Morningstar’s medium to long term view is that crude oil prices will be kept in check by increasing US shale production.